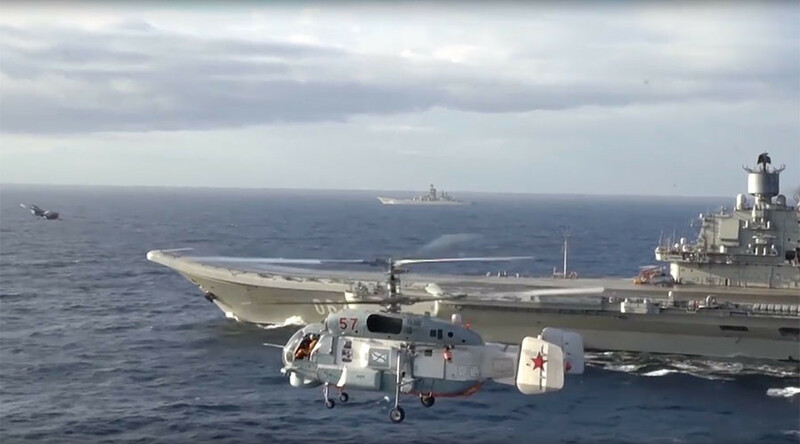 The Russian Ministry of Defense has posted on YouTube a video of its naval group in the Mediterranean, headed by the Admiral Kuznetsov aircraft carrier. It made headlines in 2016 when it was deployed to fight jihadists in the Middle East. In the clip released by the military, Russian fighter jets can be seen taking off from the deck of the Admiral Kuznetsov to carry out strikes against terrorists in Syria. Su-33 and MiG-29 jets carrying high-precision 500kg bombs, which explode within a meter-and-a-half from any target they are aimed at, have been taking part in the Russian military operation against Islamic State (IS, formerly ISIS/ISIL). The Peter the Great battle cruiser and other military ships in the group equipped with precision weapons, as well as Kamov helicopters for anti-submarine warfare, and search and rescue missions, are also featured in the video. The naval group departed from the town of Severomorsk, which is the main base of Russia’s Northern fleet, in October last year. A month later, it carried out its first combat mission in the Mediterranean. Its flagship aircraft carrier – manned by nearly 2,500 crew members and carrying dozens of fighter jets and helicopters – is also a missile cruiser, equipped with missiles to protect itself from incoming air attacks.